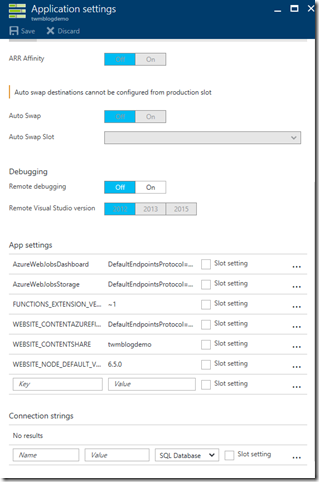 This is the second post in a series on building Azure Functions. In this post I’ll continue by describing how to add settings to your function and reference different assemblies to give you more capabilities. 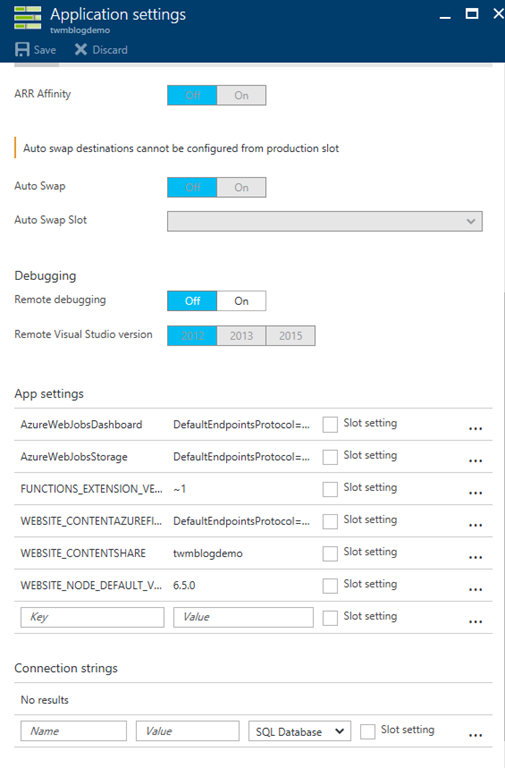 Functions do not have configuration files so you must add app settings and connection strings through the settings page. The settings are maintained at an Function App level and not individual functions. While this allows you to share common configuration values it means that if your custom assemblies need different values in configuration settings per function they will each function will have to live in a separate function app. To get to them go to the Function App Settings link at the lower left of your App Function’s main page and then click the Configure App Settings button which will bring you to the blade shown below. At that point it is the same any .NET configuration file. At some point I would like to see the capability of importing and exporting settings since maintaining them individually, by hand leads to human error and less reliable application lifecycle management. Another drawback to the Azure Functions development environment is that at the time of this post you don’t have the ability to leverage custom configuration sections. The main place I have found this to cause heartburn is using logging libraries such as log4net where the most common scenario is to use a custom configuration section to define adapters and loggers. No .NET application is very useful if you can’t reference all of the .NET Framework as well as third party and your own custom assemblies. 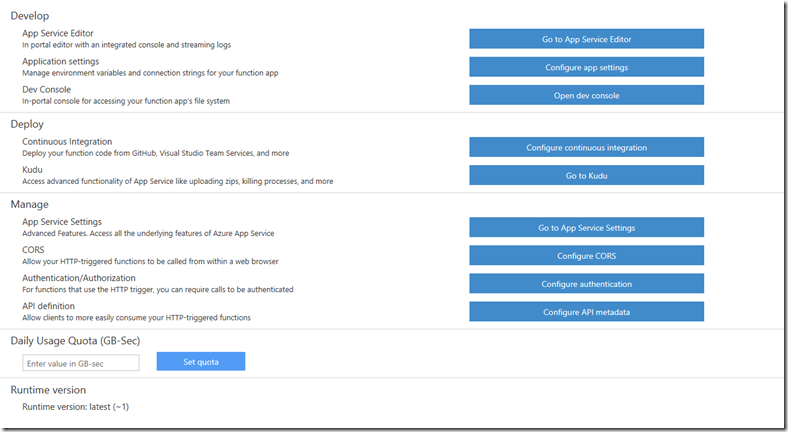 There is no add references menu for Azure functions and there are multiple ways to add references. Lets take a look at each. There are a number of .NET assemblies that are automatically referenced for your Function application. There are a second group of assemblies that are available but need to be specifically reference. For a partial list consult the Azure Function documentation here. You can also load your own custom assemblies or bring in Nuget packages. In order to load Nuget packages you need to create a project.json file. Do this by clicking the View Files link in the upper right corner of the editor blade and then the Add link below the file list pane. project.json files require the same information that is contained in packages.config file, but it is formatted in json as shown in the example below. Once you save this file and reference the assembly in your Run.csx file Azure will load the designated packages. If you have custom libraries that you want to leverage you will need to add a bin folder to your function. The easiest way I have found to do this is to open the App Service Editor from the Function App Settings page. This will open up what is essentially Visual Studio Code in a browser. Navigate the file tree to your function under wwwroot. Right click your function name and select New Folder. The folder must be named “bin”. You can then right click the bin folder and upload your custom assemblies. Once you have an assembly available you need to reference it using the “r#” directive as shown below. You will notice that native assemblies and Nuget package loaded libraries do not need the dll extension specified, but they must be added for custom assemblies. Now we are ready to declare our normal using statements and get down to the real business of functions. After this post we have our trigger, bindings, settings and dependent assemblies. This still isn’t enough for a useful function. In the next post I will cover coding and debugging concerns to complete the story.